First of all, no, Enslaved didn’t just title their 14th studio album, E, after the first letter of their name. 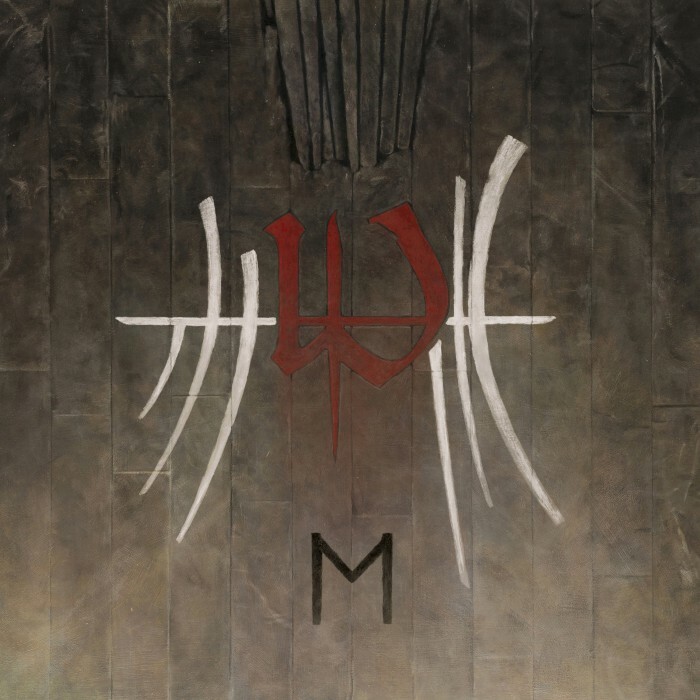 The letter is a translation/reference to the rune ‘ehwaz’ that appears on the Truls Espedal cover art — looks more like an ‘M,’ but there it is — and among the meanings it holds are ‘partnership,’ ‘collaboration’ and ‘horse.’ It’s a one-letter title and a complete concept thematic on which to base the record. And as it happens, E is the most progressive outing the Bergen, Norway, extreme metallers have yet composed in their 26-year career, offering an expanse of sound and intensity that continues to push ahead of their last full-length, 2015’s In Times (review here), while clarifying production ideas, answering the varied intentions of their first live album, earlier-2017’s Roadburn Live (review here), and — in unquestionably the most major change the band has undergone in at least the last decade — introducing new keyboardist/vocalist Håkon Vinje to the lineup. Vinje worked with Enslaved founding guitarist Ivar Bjørnson and bassist/vocalist Grutle Kjellson (among many others) in the broad-reaching and historically-minded Skuggsjá project, and in joining Enslaved with Bjørnson, Kjellson, guitarist Arve “Ice Dale” Isdal and drummer Cato Bekkevold, he fills the role formerly held by Herbrand Larsen, whose contributions to the band’s overall sound in atmospherics and melodic vocals had only increased in scope since he made his debut on 2004’s landmark Isa LP. That was six records ago, and in the 13 subsequent years, Enslaved only grew more dynamic as they progressed through 2006’s Ruun, 2008’s Vertebrae, 2010’s Axioma Ethica Odini (review here), 2012’s Riitiir (review here) and the aforementioned In Times, though the latter drew back toward a rawer production feel that E once again pulls outward into a larger sphere, and the soaring, soothing melodies of Vinje‘s vocals from opener “Storm Son” through cuts like “Axis of the Worlds” and closer “Hiindsiight” greatly enhance that impression. That Enslaved would introduce someone new in such a pivotal role feels like a bold enough step to make on a new album — one could hardly hold being tentative on some level against them, given how much Larsen brought to their sound — but they brazenly continue their apparently ceaseless and willful growth as songwriters and performers, and Vinje absolutely shines in the role into which he’s stepped, carrying the penultimate “Feathers of Eolh” (8:06) through ambience the thrust alike as Enslaved gallop with the fury that’s become one of their trademarks and step back to allow vocal harmonies to carry more subdued verses. It is a stunning late-album moment. And by then, not the first time Enslaved have made the spine shiver. E launches with its longest track (immediate points) in the adventurous 10:54 “Storm Son,” which begins with captured outdoor sounds — birds, a shout, a Viking horn, a whinnying horse — leading to an unfolding of shimmering guitar and emergent push. It is a patient opening and when the verse kicks in, Vinje backs Kjellson‘s telltale rasp to set the stage for an exploration of proggy guitar-led turns and chug past the midpoint, heading toward a forward surge that carries them toward a repeated chorus that doubles as crescendo. The chant-style vocals in back of that hook are a foreshadow of what will become a major element throughout E, and one can’t help but wonder if perhaps Bjørnson is carrying a bit of influence from working with Wardruna‘s Einar Selvik (who also makes a guest appearance here) on Skuggsjá into these tracks, since even second cut “The River’s Mouth” — which is the shortest at 5:12 and an immediate contrast to “Storm Son” as it brings Kjellson to the fore in the verse and instead lets Vinje handle the chorus — seems to have some aspects therefrom at play. 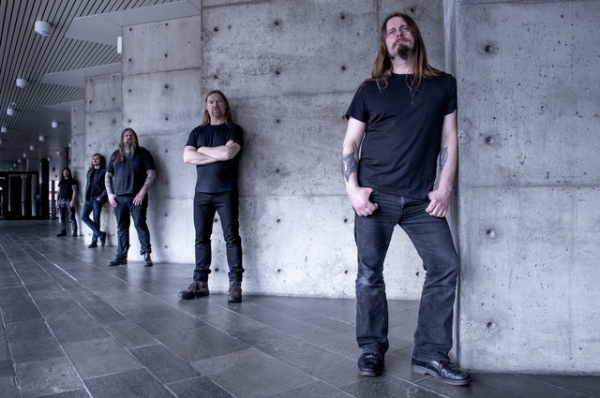 Of course, creative arrangements of vocals, guitars, keys, and other instrumentation, are nothing new for Enslaved, but as “The River’s Mouth” swirls to its apex and the acoustic opening of “Sacred Horse” — a definitive moment of arrival, if brief — there’s a prevalence factor for resonance of mood that’s impossible to ignore. “Sacred Horse” (8:12) kicks into a vicious pummel with some of Bjørnson‘s roaring growls complementing Kjellson in the verse before a spacious-but-classy guitar lead takes hold before the next push, building a tension that continues as Vinje takes an organ solo after the three-minute mark and brings a melodic verse shortly before a break at 4:25 introduces the guitar part that will serve as the rhythmic bed for a thudding march that proves to be a standout moment of E as a whole, Bekkevold introducing the progression on toms before crashing cymbals to get officially underway. Guitars make a neighing sound to recall the ‘ehwaz’ theme, and choral vocals top the nodding groove in one of the record’s most singularly affecting moments. Amid laughter, they bring it back around to a few last measures of furious push to close out, and let “Axis of the Worlds” (7:49) take hold with more immediacy and a rocking feel at the start of side B. As their titles would seem to acknowledge, “Sacred Horse” and “Axis of the Worlds” feel very much like the heart of E in their presentation. I won’t take anything away from the impact of “Storm Son” or “Hiindsiight” at the start or the conclusion, and the direct contrast between “The River’s Mouth” as the second cut and “Feathers of Eolh” as the second-to-last seems nothing if not a purposeful display of range, but with the one-two of “Sacred Horse” and “Axis of the Worlds,” Enslaved provide some of their proggiest stretches and show how they’ve made these elements cohesive with the context of their own, ever-shifting approach. To wit, the organ lines of “Axis of the Worlds,” the chorus hook “Chase the serpent/Step on his tail” delivered in clean and echoing screams, the movement into returning chants amid a section that’s as much black metal as it is still somehow drawing from psychedelic and classic progressive rock, and the way the song seems to resolve itself in making its way back to the chorus at the end, the band clear enough in knowing what they want to do to not even in this moment lose sight of the underlying foundation of structure amid all the raging complexity. Especially after the thundering “Sacred Horse” — and, for that matter, before “Feathers of Eolh” — it gets to the core of what Enslaved accomplish with E, manifesting ideas of duality, complement, collaboration, whether that’s between band members or between the band itself and their craft or the instruments they’re playing. Begun at a rhythmic rush, “Feathers of Eolh” is peppered with nuance of play and topped by piano sounds and guitar flourish for its proggy intro, kicking at about the minute mark into chant-backed drive and bringing in the aforementioned highlight performance from Vinje on vocals. His voice — clear, confident, powerful, layered — recalls some of what Larsen did melodically, but he brings his own edge to the changes in key as well and one expects he’ll only continue to make the role more his own as Enslaved move forward. “Feathers of Eolh” touches on what might be considered Viking post-rock (stick that in your genre search engine) in a brief interlude before springing forth again for the next verse and turns circa six minutes deep into a head-spinning reinterpretation of the intro that meets with further chanting, double-kick from Bekkevold and piano skronk that builds to a sudden finish, bringing the melodic first-minute intro of “Hiindsiight,” which wraps up E fluidly while still holding a surprise or two of its own. Namely: saxophone. At 9:36, “Hiindsiight” is the second longest inclusion and thereby bookends E with “Storm Son,” but its structure is decidedly working on another wavelength. Cutting from the intro to about as close to a doomed roll as Enslaved have ever come, before the track is into its third minute, it has turned once again to lush melodies from the guitar and keys, trading back again before introducing what sounds like a tenor sax for an echoing solo prior to the halfway point from which Kjellson‘s vocals pick up like throaty searing and jazz instrumentation just go together all the time and there’s nothing at all unusual about it — it’s brilliantly pulled off — and with airy noodling guitar holding the melody beneath, “Hiindsiight” welcomes Vinje back to the arrangement briefly, but gurgles out at around 5:45 to let the guitar set the stage for the E‘s final stretch: a patiently delivered build of melody, chants, the sax, and a wash that’s unlike anything Enslaved have done before and yet so definitively theirs that it couldn’t possibly have come from anyone else. It is a suitably glorious ending to an album that does nothing less than begin a new era for the band. I’m writing as a fan, but the bravery with which Enslaved take to the formidable task before them in E only underscores how special this group truly is, and in thinking of the stated them of collaboration, one would be remiss to ignore how pivotal the core founding duo of Bjørnson and Kjellson are, and how much their work together has changed over the years while still holding fast to the creative drive that has been so easy as a listener to take for granted all along. It’s only one letter, but E spreads itself across the consciousness with worldbuilding mastery, and is a work of true vision simply not to be missed. One of 2017’s best and then some. Recommended. This entry was posted	on Wednesday, October 4th, 2017 at 10:16 am	and is filed under Reviews. You can follow any responses to this entry through the RSS 2.0 feed. You can leave a response, or trackback from your own site. There goes another 0.692 seconds.